Mexico is America's #1 vacation destination. But how many Americans have gone off the beaten path of Mexico vacations? Gone beyond Cancun, the Riviera Maya, Los Cabos, and Puerto Vallarta? One great Mexico destination worth discovering is the state of Yucatan. It is in southern Mexico, in the fishtail-shaped tip whose endpoint is Cancun. But an hour inland from Cancun, you are in the authentic Yucatan and far from Mexico's big cities. The Yucatan is the heart of the ancient kingdom of the Mayans. Here, the Mayan language is widely spoken and Mayan dishes are cooked everywhere. World-famous Mayan temples, like Chichen Itza and Uxmal, draw crowds of visitors daily. Where Does a Luxury Traveler Stay in the Yucatan? The Luxury Collection from Starwood Hotels boasts over 100 luxury hotels throughout the world, from the cutting-edge design hotels to historic gems like The Haciendas. 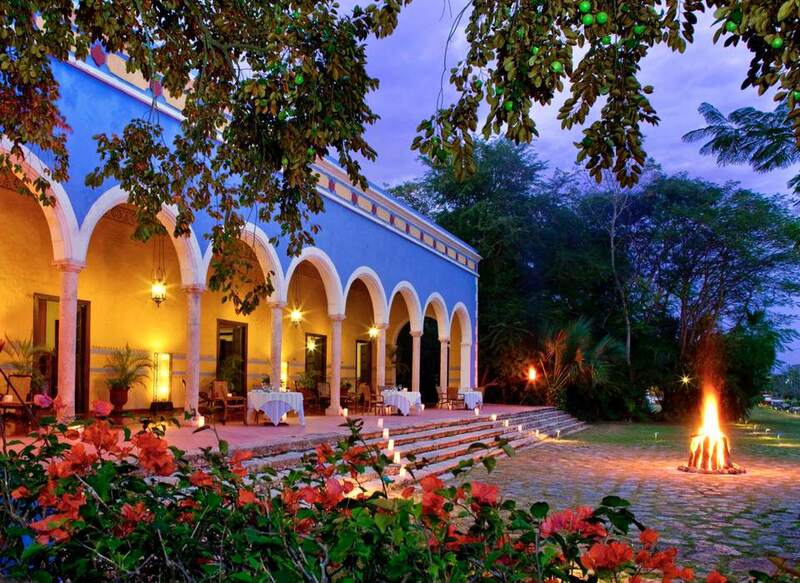 Five elegant estates in and near the Yucatan make up the Haciendas. Continue to 2 of 18 below. Hushed, verdant Hacienda San José is ultra-elegant. Here, you feel transported back a century ago. Relaxation is what you do here. Like several other of The Haciendas, Hacienda San José was a family-run plantation. Workers lived on the property, which functioned as a self-contained community. Continue to 3 of 18 below. Everyone involved in Hacienda San José's sisal-plantation past -- owners, workers, burro-car drivers — entered Hacienda San José through its impressive arched gateway. During its plantation decades, Hacienda San José's sole crop was sisal. This is the tree material that forms rope; the natural rope is still often known simply as sisal (or sisal rope). • Today, sisal has made a comeback as a natural carpeting material and as an eco-friendly covering for cats' scratching posts. Continue to 4 of 18 below. Today, Hacienda San José's handsome pool is the main gathering spot for guests. Considering the Yucatan's tropical setting and climate, Hacienda San José's pool is warm enough for guests to swim in all year, except for uncharacteristically cold days in December through February. The pool is luxuriously long (over 60 feet) and entirely suitable for lap swimmers. But most guests find their way over to the pool to laze, splash, and catch up on their reading or their tans. And some grab the over-water hammock for blissful naps. First come, first served. Since you're wondering: yes, the pool offers good wifi. Continue to 5 of 18 below. Hacienda San Joséo offers a range of guest accommodations. One deservedly in-demand type of room is the Mayan Villa. These are four cottages built like Mayan houses. Mayan Villas are rambling one-bedroom accommodations. Its enormous bedroom is also a living room. The bathroom extends over three areas (double sink vanities, toilet, walk-in stone shower). You'll also find a patio with a table and chairs and a hammock, plus an outdoor stone-lined tub and shower. The Mayan Villa bed is a remarkable feature of this hotel. It is suspended from the bedroom's peaked, thatched palapa roof, a common architectural style in tropical Mexico. The bed swings when you climb onto it (and you can't help but giggle). At night, the bed is swathed in mosquito netting. It's as romantic as it is effective. Continue to 6 of 18 below. Hacienda San José's most requested room is this king room. Its bathroom was built around a towering ceiba tree. These majestic trees are considered holy by the Mayans, who regarded them as the root of the world. Hotels can get very competitive ​about their bathroom amenities. But this one is unique in the world. Continue to 7 of 18 below. Hacienda Temozon itself is a stately plantation built in the "Mexican Belle Epoque" style of the later 1800s. Its bright pumpkin-hued walls and brilliant flowering trees will treat your eye as you settle into one of the most serene resorts in Mexico. Guest services -- rooms, service, food and beverage, spa, activities -- are of a very high order at Hacienda Temozon. And despite Hacienda Temozon's uniqueness and luxury, it is a very affordable getaway for norteamericanos. Continue to 8 of 18 below. Hacienda Temozon is very private yet very social. Guests gather at its indoor-outdoor bar and restaurant, built on the estate's elegant terrace. Post-cocktails, a lovely, leisurely meal awaits. Hacienda Temozon's cuisine spotlights ultra-fresh farm-to-table fare, with market-fresh ingredients. They are prepared with creative Mexican spins to form classic salads, fish, and meat dishes. You've never had so-called Mexican food like this before. Continue to 9 of 18 below. Hacienda Temozon was a working sisal plantation for many years. The property ran on several sources of energy: mechanical, human, and burro. Hard-working burros who were stabled right on the property were hitched to wooden carts that ran on rails. The carts were loaded with freshly cut sisal, and the burros gamely pulled them along. Continue to 10 of 18 below. Hacienda Temozon offers guests a variety of personal services. You can get pampered at the spa, arrange a customized twilight dinner for two, and have the bartender create a unique cocktail just for you. But the hotel's shaman is an outside-the-box guest amenity, even in the world of luxury hotels. At Hacienda Temozon, you can book a private session with the property's very own Mayan shaman, a mystical medicine man named Reto. He has studied all the ancient Mayan rituals and folklore. And he knows a lot about modern medicine, too. When I visited, this shaman was able to sense the invisible physical problems of his clients. Hacienda Temozon's Mayan shaman is a remarkable individual. Yet Reto was not born into the Mayan culture. This miracle worker is not from the Yucatan but from Switzerland, and he became a master of the Mayan healing arts. Continue to 11 of 18 below. The ground beneath Hacienda Temozon is dotted with cenotes, spooky underground caves with water in them. Cenotes are unique to Mexico's Yucatan state (where the Hacienda is set) and the surrounding states, Quintana Roo, and Campeche. As the region's only source of fresh water. Cenotes are sacred to Mayans as mystical places where the earth meets the ocean. In Mayan times, cenotes were the domain of spiritual leaders called shamans. Continue to 12 of 18 below. Hacienda Temozon's Hol-Be Spa — Mayan for Sacred Water — is set inside a natural cenote cave. You descend its stone steps, breathe in the fresh, crisp cenote air. Then, when you relax into your massage, you find out that Mayans are simultaneously strong yet gentle, and have magic hands. Prepare to indulge in one of the most unusual, and most effective, massages of your life. Continue to 13 of 18 below. Hacienda Temozon offers lots of spots to cuddle with your travel companion or meet other guests. You can do both at the Hacienda's sprawling pool. It beckons with chaise lounges, hammocks, sun, and shade. Plus waiter and bartender service. Continue to 14 of 18 below. For many guests, Hacienda Uayamon is their dream of old Mexico come to life. Built in 1700, this Hacienda resembles a peach-painted palacio (palace), its two stories embellished with petite balconies, coffered windows, and delicately scrolled wrought iron railings. Have you packed your fantasies of olden Mexico? Continue to 15 of 18 below. Certain things about Hacienda Uayamon have not changed. All visitors still enter through this grand ceremonial path, beneath a canopy of towering ceiba trees. Then as now, visitors are impressed by the natural beauty of the Hacienda and charmed by the sound of the Yucatan's "whistling frogs." Continue to 16 of 18 below. A vacation at Hacienda Uayamon is like a getaway back a few centuries. The Hacienda is over 300 years old and conveys all the romance of its colonial origins. This King Suite is set in the space where the Hacienda's elegant front office used to welcome bankers and buyers of sisal, which the Hacienda produced. You can still see the office's dignified reception booth. Continue to 17 of 18 below. One of the pleasures of a getaway to Hacienda Uayamon is the resort's pool. It is built into a courtyard that was a part of the resort's early-1700s design. Taking the plunge here is like jumping back into the past. And the sun-warmed water feels simply delicious. Continue to 18 of 18 below. How many spas have you been to that channeled the tropics with rainfall showers and hibiscus petals in the bath? OK, but were they real? Set amidst jungle vegetation in a secluded patch of the estate, Hacienda Uayamon's spa is the honest-to-goodness tropical spa. Sette into the spa, and let your senses soar. As you are pampered with a facial, massage, or luscious body treatment here, you open your mind to the sights, smells, and sounds of the Yucatan jungle. Hacienda Uayamon's Hol-Be Spa is like a return to Eden. Mexico’s Pacific vs. Caribbean Coast: Which is Right for You?